Are you the type that must break a sweat, get out of breath, slump to the floor and crawl out of class? When your Sensei says "Ten more!" do you muster up every last ounce of muscle fibre to push it out? What about turning up to class sick, tired and injured... feeling drained but grateful for the supplements to get you through? Well, if you haven't yet followed my advice regarding rest in last weeks blog, perhaps I can give you some thoughts on what I consider to be giving Maximum Effort!! You may already have an answer, perhaps it’s not something that can be put into words, it will just be a feeling and you’ll know it when you see it. In Karate often we are told to put in maximum effort, and when I was growing up practicing Shotokan I measured effort by the amount of sweat pooling at my feet; sometimes I would even get light headed!! This was how I trained up until my late 20’s - until something changed; my understanding of effort. I learned during Yoga classes that we can only do so much as the body will allow, and sometimes it is better to hold back slightly, than to push through the pain / stiffness / tiredness and result in injury or less progress. It took me a while to implement this into my Karate, but I am here to share with you how you can to. Step 1: If you are injured, reduce your training intensity depending on the severity of the injury. Reduce the motion and use of the injured part whilst moving enough to keep warm. This can look like a 60% or even 40% of your maximum effort. Sure, you are going to be slow, the last to finish and the softest defender, but it will not only allow better recovery from your injury, it will also give you the opportunity to focus on getting the techniques correct, rather than relying on speed. Step 2: Don’t try to do so much all the time. If your body is tired, sluggish, and dragging its heels to class then it’s time to take a step back. 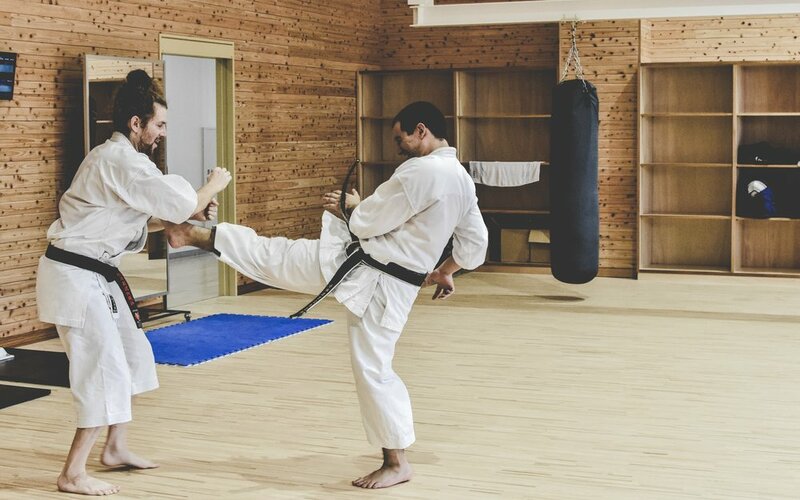 Many of us who train in Karate like to overreach our body’s capacity before its ready, and think that the correct way is to just "put up and shut up". What is happening is a case of adrenal fatigue from overtraining. At one point I was sitting in an overtrained state for about a year, which resulted in me getting injuries. Even today I can tell when my body has had enough after weeks of the same training and I have to take a few days off. Once I stopped trying to squeeze in extra fitness classes and took the time to get plenty of rest – and reduce my caffeine intake, I was finding a better balance with my energy levels, and better performance in the Dojo. Step 3: Don’t try and emulate someone’s exercise fully when it is new to you or when it starts to hurt. Sometimes in class someone has a new Yoga move to show you, they might have been doing Yoga for several years and built up a solid practice, but if they try to get you to do some crazy back bending, or twisting, even if you have no experience being “on the mat” then be cautious. Any exercise, whether perceived as gentle or not, takes time to learn and have the body adapt to. In Yoga, as well as Karate and weight exercises, there is always a foundation form, beginner’s exercises and a syllabus to allow you to work up to the big stuff. Step 4: Lastly, be careful of setting out to do exercises you’ve found on the internet. Karateka all over the world sometimes don’t have good body awareness and very rarely do they get corrected by others. Yes, if they are doing Karate wrong then a Sempai may step in, but if your going like a bat out of hell swinging that Kettlebell around and it's causing all these microtraumas in your muscles, are your Sempai likely to know? Sometimes, it is best to find an exercise, then check it over with someone from a gym as well as someone who is knowledgeable in the Dojo, and start it off slow. There you have it, if you follow those steps then you’re on the right track to building your body up the right way, instead of knocking it around till you are unable to live day-to-day without being in serious pain. Go to Okinawa, check the age and the way many Okinawans train – you’ll come across a number of 80 year olds still swinging Bo, Sai and with a mean grip. Often they train without even breaking a sweat! !